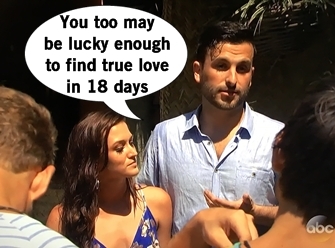 Janner (AKA Jade and Tanner for you pleebs who don't know the supercouple success story of Bachelor in Paradise last summer) make a surprise visit to remind everyone that 3 weeks of dating on reality TV can end in marriage. They arrive with a date card in-hand to give out after deep interviews with each potential couple. Said grilling make Lace question her relationship with Grant since she's not ready to return his "I love you" after a week of dating. Janner are turned off by Josh's over-eagerness to get a special date with Amanda, wondering if he has ulterior motives. Ashley I tells Janner that Caila/Jared is her worst nightmare and they don't care in the slightest for her feelings as they feel the couple are on the right path. There are other couples in Paradise besides Jared and Caila, so let's discuss before getting into their nonsense. I forgot to mention earlier because of writing flow and not wanting to make another picture that Vinny and Izzy breakup. Not only does he leave Izzy, but Vinny leaves Paradise in an Uber. Jennifer tries to get Nick to open up and let his guard down, but he's afraid of looking like a joke on reality TV again. A date card for Evan and Carly seems like the ideal opportunity to infuse some romance into their friendship, allowing them to really open up to each other in a rebirth ceremony in a hut. Carly likes the way Evan looks at her even when she looks like sweaty hot garbage and they have a much better sweaty makeout kiss. Jared and Caila's date card lets them fake eat dinner in the rain and even in bad weather Caila has flawless hair. They have a very frank discussion about Ashley I hindering their relationship, but agree they are into each other. They leave fake dinner and strip down to their undies to makeout in the dirty looking river. Ashley I decides to try to use psychological warfare to breakup Jared and Caila because she has literally nothing better to do. Because Jared's a dope, he buys it hook, line, and sinker. Caila has to reassure Jared that she is definitely into him and he's too stupid to notice Ashley I is in love with him and doing anything to break them up. Tired of the BS, Caila confronts Ashley about her interference in their blossoming relationship. Caila wonders if Ashley is just going to sabotage everyone else (AKA Jared) until she finally finds someone to move on with. The answer is obviously yes.